Ready for the show of a lifetime?? 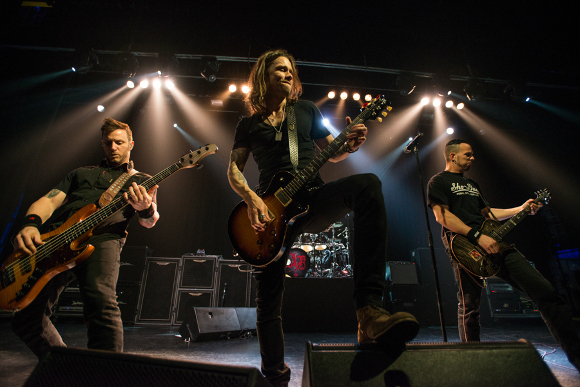 The amazing alternative metal band Alter Bridge are coming LIVE to The Wiltern on the Sunday 19th February 2017! If you haven’t got your tickets yet, now’s your chance to grab them quick for this HUGE act, best known for their live shows and relentless tours. They refuse to let fans down – so don’t let them down either! Formed of frontman Myles Kennedy – known for his incredible vocal range and flexibility and work with other musicians such as Slash – along with Mark Tremonti on lead guitar, Brian Marshall on bass and Scott Phillips on drums, the band released their debut album, “One Day Remains,” in 2004, the very same year the band got together. Although critical reviews were mixed to positive, the album was shortly certified Gold by the RIAA – proving that its always the public vote that’s important! Following this, and the release of their second album, “Blackbird,” in 2007, Alter Bridge were buoyed by a colossal wave of public and critical support. Fans expected, they delivered, and show no signs of stopping! Today, they tour in support of their 2016 album, “The Last Hero,” with more gusto and energy than ever before Fans and new listeners alike grab your tickets and head on down to the Wiltern – its going to be an incredible night! !